TIOGA COUNTY - Championship events steal the spotlight this week and none are bigger than the Section IV Wrestling Championships and Section IV Bowling Championships. Newark Valley, Owego, S-VE, Tioga and Waverly combined to crown 10 individual wrestling champions at two Division II qualifying tournaments Saturday. They will lead a large contingent of state tournament hopefuls into Windsor Friday and Saturday. The bowlers vie for trips to the state championships Friday and Saturday. Also big on the docket are the STAC Bowling Championships and the IAC Cheerleading Championships. � The STAC bowlers meet at Midway Lanes in Vestal for their championship tournament. � The Owego boys swim team closes out the home regular season hosting defending Section IV Class A champion Ithaca. � Candor boys basketball hosts IAC South Small School co-leader Newfield. 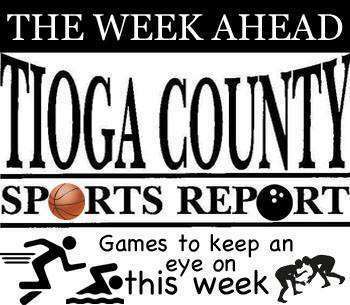 � The Owego girls basketball team looks to improve to 17-0 at U-E.
� Candor and S-VE renew their neighborhood rivalry with the girls playing at Candor and the boys meeting in Spencer. The Panther boys currently lead the IAC South Small School division. � The Newark Valley boys basketball (7-10) has two games remaining and need to win one to qualify for the postseason. The first opportunity is on the road at Edison (1-17). � Owego girls basketball visits Ithaca. � Newark Valley boys basketball entertains Notre Dame (8-7) in what could be a must-win (if the Cardinals lose to Edison Tuesday). � The Section IV Division II Wrestling Championships begin at Windsor. � The Section IV Boys Bowling Championships will be held at Midway Lanes in Vestal. � IAC South Small School co-leader S-VE hosts IAC North Small School champion Moravia in what could be a prelude to the IAC Small School championship game. � The Section IV Division II Wrestling Championships resume at Windsor. � Newark Valley hosts the IAC Cheerleading Championships.